And then, THANKSGIVING!! Thanksgiving was sooo good. We went and ate breakfast chocolate pie with some other sisters and made the cute little gingerbread turkey my sweet mom sent us. And then, we went out be to go make some visits. One of recent converts called us and told us her husband got taken to the ICU and her daughter wanted to talk to us. So we were able to go over there and say a prayer with them and comfort her and her daughter for a bit. I am truly so grateful for my family. We had dinner with the Banks family. They are the family that had me over for my birthday and surprised me with cheesecake. They are amazing. I think one of my favorite things Bout being on my mission is really getting to know who I want to be and what I want my future family to be like. After lunch, we went to the VC for shift :) the VC is seriously gorgeous. Saturday, there was a lighting ceremony at the Visitors Center in the evening. It is getting so cold here! This weekend there was an ice storm and it has been raining so hard since then. Also, the VC got a makeover with the A Savior is born campaign!! I'll talk more about that in a bit. Sunday was of course my favorite day because of church. I LOVE THE SABBATH. I love being able to recommit myself to following the Savior. And the other exciting event that happened on Sunday.. This came out. You HAVE TO go check out christmas.mormon.org right now and watch the TWO videos the church put out. They are sooo amazing. I am so grateful for Jesus Christ and all that he does for us. I love the video on that website "A World Without a Savior". I cannot imagine my life without a Savior and everything that is made possible because of His Atonement. I am grateful to be a part of His gospel and His true church. I love you all so much! Sorry I don't have much more time to write! Oh but real fast... Our adventure PDAY .. We went to downtown Kansas City to walk around and shop at the Plaza! It is so gorgeous down there! on being thankful for the tender mercies. First of all, happy early Thanksgiving!! I am so grateful for all of you. I am so grateful to be a missionary right now. Seriously, I am madly in love with this work and this restored gospel. I cannot describe how much this gospel means to me. I am grateful to know that I can return to live with my Heavenly Father some day and be with my family forever. I am grateful for temples and the opportunity that all of us have to be sealed with our families for eternity. I cannot think of any greater blessing and promise our Heavenly Father could give to us. I am so grateful for prayer and the chance that we have to communicate and ask questions to Him and receive real personalized answers through the Holy Spirit. How amazing!! I love it! - the perfect exchange with Sister Prior on Wednesday and Thursday. I love Sister Prior. She is such a consecrated missionary and she helped me so much in our area for those short 24 hours. We went to go visit a less active whose girlfriend is one of our investigators. I learned so much from Sister Prior about how to really develop a more trusting relationship with less active members and investigators and how powerful that can be. We sat and chatted with them for about 45 minutes and then out of nowhere they both bore their testimonies to us of this church and tell us some plans they have for the future about them coming to church more and taking the lessons more. It was a miracle!! All because they were comfortable around us and the Spirit was there guiding the conversation. She is having her baby in 3 weeks, so after that, we will start having lessons with them more frequently and they will start coming back to church!! It was amazing. Pretty much that exact same thing happened to another less active family who we brought to the VC the other night as well. I love being a part of this work and being able to see the miracles the Lord is letting us be a part of. Oh and we had dinner with the Burroughs. Their daughter is the CUTEST! - how the Lord answers prayers. I have a very strong testimony of the power of prayer and Thursday evening that was confirmed. Little backstory, as I am approaching 6 months in my mission, I am getting soo nervous about my future about having to come home and keep the habits that I have now and continuing to progress and to strengthen my relationship with my Heavenly Father in His gospel. So, to help myself, I have gone crazy on goal setting. In our companionship, we set personal and comp goals every week and I am setting daily goals to accomplish those goals and then goals for my whole mission and life. Pretty much goals on goals on goals.. aka overwhelming, but also amazing. I love goals. Anyways, throughout the exchange with Sister Prior, I was talking with her about this and about the end of our missions. and THEN, at the end of shift at the VC that night, a girl walks in and I greet her and get to know her a bit. I took her through God's Plan and then just chatted with her. She just got home from her mission in January to Peru and felt prompted to move here to Independence (love these stories, people are so led by the Spirit it is amazing). Anyways, I asked her how it is being home from her mission, if it is weird or sad or..etc. and she responded so joyfully, "It's great! I love it!" It caught me so off guard. Every missionary I know that goes home has such a hard time with going home and is sooo sad for a month or two afterwards or longer, so I had her come sit down with me and explain to me how she got there. The things she told me was exactly what I needed to hear. 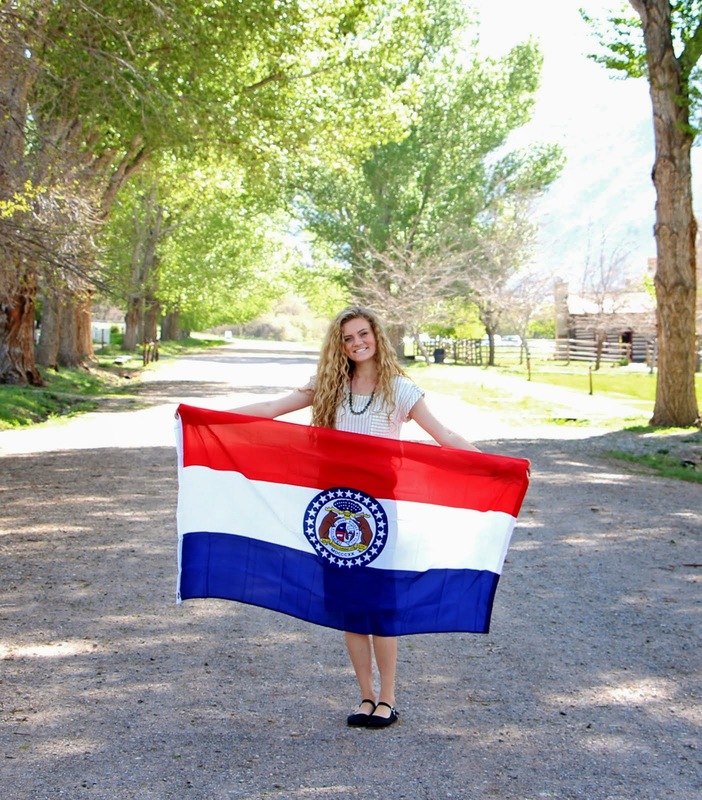 This whole experience is extremely hard for me to share and try to write because I'm not sure if any of you will understand, but that's the story of a missionary. right? haha. Anyways, she shared with me soo many things that I needed to hear and really changed my whole mission. Two things she shared with me were: 1. Live in the present. always. strive to search for His will every day of your life and you will have fulfilled your purpose in this life if you do that and act on the spiritual promptings you receive. and 2. (after I was thinking to myself.. well great, I've just spent so much time focusing on goals for my future and this is exactly what I am supposed to do... not do that. ha) she said, "goals are great. They are there for direction." I really can't describe much else to you all. This girl is amazing and I feel so privileged to get to meet her and so many others on my mission. but in summary, of that experience.... God is real. He knows you. He loves you and He is so involved in the details of your life that we cannot even comprehend. I have a testimony of that as I have seen glimpses of how He is involved in our lives over and over and over throughout my life. - getting a cute package from my sweet momma that included Christmas lights that we put up in our room. Tender mercy. Seriously. That is one of my favorite Christmas traditions. Sister Flake and I are seriously in love with them! I love you all so much! Have a great thanksgiving weekend. Eat some yummy thanksgiving food for me :) Remember to record some things you are most grateful for! I hope everyone has had a fabulous week. This week has been great! We have seen soo many miracles. I'll share two short stories with you all today. 1. On Friday, this family that we have been teaching that is one of my favorites (the little boy who called me Rapunzel and Sister Flake Belle #precious) moved out of our ward boundaries and into 3rd ward boundaries (Sister Baggett and Sister Helmbold.. yes those details matter). We couldn't get in contact with them all week to schedule a time for us to come help them move until literally an hour before. The other sisters were amazing by getting 8 members to come out with them to help them move earlier in the week and we were stressing because we couldn't get in contact with them all week and then everything pulled through! So that in and of itself was a miracle. We were praying soo hard that everything would work out. So we help them move on Friday afternoonand they were just like.. "What is happening? Where did these 10 random people come from?" haha, we forget that outside of the Mormon community, that's... not normal. ha. Anyways, that evening we get a text from our investigator Dawn saying "Thanks so much for helping my family!! It means so much to me!!" Back story on Dawn.. She came into the VC 4 months ago and Sister BAGGETT taught her the first lesson and committed her to be baptized and she accepted! She lives in our area but then started a job as a truck driver.. so haven't been able to stay in contact with her until Friday night. We got that text and were like.. What in the world? We asked her if that lady was her daughter and she said Yes! You didn't know that?.. haha, umm NO!!! so yeah, crazy miracle. What are the odds of that happening. It was funny because we had asked that lady if she had heard of the Book of Mormon before and she said that her mom has started reading it and we were like, oh cool! (assuming her mom was RLDS or something) and never thought anything else about it. Such a testimony to me that this is the Lord's work. He is involved in every single detail of this work and we, as missionaries and members, just simply are privileged enough to be a part of this. We have such a great calling in these last days everyone! We get to be an instrument in the Lord's hands and help Him in the most important work of eternity. Elder Holland says it perfectly, "Ours is not a feeble message. It is not a fleeting task. It is not hapless; it is not hopeless; it is not to be consigned to the ash heap of history. It is the work of the Almighty God, and it is to change the world." So, what are we going to do? For me, I am going to always serve Him. I am going to always strive to become more like my Savior Jesus Christ. I am going to smile more. I am going pray more sincerely. I am going to repent of all my shortcomings and ask for strength in order to overcome them tomorrow and the next day. I am never going to let a day go by where I don't think of my Savior and all that He did and does for me. I am going to be a disciple. 2. Last night we had a lesson with Paulina (the sweet girl we had a lesson with last Sunday) at the Visitors Center that was AWESOME!! We taught the Restoration and showed her the short Restoration movie. The spirt was soo powerful. She wants to change her life and find more meaning to it.. umm.. perfect because those are the exact things we promise to everyone that this message of the restored gospel of Jesus Christ can do for them. We invited her to be baptized and she said, "Yes! What do I need to do?" I wish you all could feel for a moment what Sister Flake and I were feeling at that moment. haha. so. much. joy. pure joy. We are so excited for her. I cannot wait to see how she enjoys this gospel because it truly is amazing. I love it. She has planned to be baptized on December 5th! Less than three weeks away! So we have a lot of planning to do, but we cannot wait. Keep her in your prayers. And wow, the Restoration movie. Sooo powerful. I am so blessed to be apart of this gospel and have this knowledge of the restoration. I cannot imagine my life without this knowledge. the rest of this week... BYU weekend!! BYU played Missouri on Saturday so literally everyone and their mom was in Independence touring Church History Sites. On Saturday, there were over 1300 people that came into the VC! Which is madness. The highest day in the summer for us was 700 people in one day. All last week, we had an average of 100 people, so Friday and Saturday was like complete craziness for all of us, but I loved it sooo much!! Also, my sweet friend, Tara, was there!!! It was soo good to see her! She seriously changed my life way back when. We took a picture but I don't have it rn, so I'll send it next week :) Here's a pic of the tailgate party at the stake center next to the VC... only made me miss BYU slightly... he he. Till next week!!! I love you all so much!!! Don't forget to pray and read your scriptures!! Can't wait to hear how your week went! I love you all so much. I hope this Monday morning has been amazing already for each and every one of you. I am so grateful for all of you. This week, has been crazy. Some lows and some highs. but hey, that's life. and wow am I grateful for the lows. That is when we are tested and that is when we grow. If our lives were perfect all the time, we would not need to be here. there would be nothing for us to learn. there would be no choices for us to make. those choices, that agency is sooo important. As for me, I choose to be happy. I choose to be positive, I choose to see the good in every situation (or at least try to haha). What a difference these simple choices of attitude can make. I hope that each of you this week will make a choice for this week that is personal to you. A goal to improve and to PROGRESS!! As this sweet old man in our ward always says when we see him, "if you aren't progressing you're in a rut! You know what a rut is? It's a grave! With it's ends kicked out! Have you ever been in a rut? I have.... (then he goes on to tell the exact same story of how he was in a rut 5 years ago when he was driving in his car)" I can't tell you how many times I have heard him say this story to me .. maybe 30? haha, but wow am I grateful for the principle that it teaches me everytime. Our job here on this earth is to progress, to do exactly what this sweet old man warns us of.. to not be in a rut. Choose to progress this day. Set a specific goal for something you can do this week. Some ideas: to read your scriptures for 30 seconds more than you are now (even if that means you are only reading for 30 seconds a day.. it's worth it), compliment one person a day, say thank you more, remember your morning and evening prayers, go to sacrament meeting more prepared spiritually this week, etc., etc. as I mentioned above, there were lows this week. Appointments fell through, our investigators won't keep their commitments, so much more. We have been trying so hard to work harder. Try harder to help our members in their missionary efforts more. soo many other things. up until this sunday.. :) I seriously may just write only about this Sunday this week. It was soo good. The tender mercy, after all of our appointments canceled on Sunday evening, we went to the VC for an appointment we had with a referral we had received from a senior couple that had served here a while back. We had only met them once and based on the luck we had the past few hours, we were unsure if they would show. They did show up. These sweet two twin teenage sisters are sitting there in the vc talking with one of the other sisters when we walked in. The member that we brought (a girl who is heading out on her mission to New Zealand in January) happened to be good friends with them from High School and was pretty much the best team-up. We took them through God's Plan for His Family and sat at the Christus with them. We testified of eternal families to them and testified of our Savior and the peace that comes from living our lives in harmony with how He would have us live our lives. We invited them to learn more and they really wanted to. This was the greatest tender mercy of the week. I testify that our Heavenly Father loves us. He cares about us and is with us every step of the way in this life. He answers our prayers. I am so grateful for my Father in Heaven and so grateful to have had so many experiences in my life to witness for myself His love. I invite all of you reading this email to find and have these experiences. He will answer your prayers and He will let you know that He loves you. I can promise you that with every part of me. I love you all so much. This gospel is true. The other part of Sunday.. this weekend was Stake Conference for the Independence Missouri Mission. Elder Baxter came to speak to us. He is from Scotland and the talk that he shared Sunday morning was incredible. He started by having our Stake President call out 10 people in the building to come bear their testimony for a short 2 minutes or 120 seconds if they couldn't keep it short ;) and then he got up and talked to us about the Sabbath and how the Savior SIMPLY wants us to give this one day of the week back to Him. That is all. He wants our hearts to be turned to Him. He wants us to not get distracted on just this one day. He then testified of this church and the work that we get to be apart of. This church is amazing everyone. More importantly, this gospel is amazing. The plan that our Heavenly Father has created for us is flawless and amazing. I love it. I love being a missionary and getting to share this message with others. I wouldn't trade it for anything in the world and as my 6 month mark is coming up, I am already getting nervous for coming home. Nothing else in this life will ever come close in value and importance as being a full time missionary for Jesus Christ. I love you all so much, thank you for everything you do again. Long time no see!! This (half) week has been so good, especially for my companion and I. I can't even begin to tell you (again) how our Heavenly Father answers our prayers. It is incredible. I am so grateful for all the miracles that I get to see out her on a mission. It is truly the best thing in the world to get to see other peoples' lives change because of this gospel. These past two weeks we have been teaching this guy named Michael. He is so incredible. We were out contacting a potential in an apartment complex a couple weeks ago when we felt prompted to go tract the 4 apartments next door. We did, and the very last of the 4 was Michael. We taught him Saturday afternoon for the second time. He is so genuine and honest. He is one our favorite people to teach. This past lesson, he told of us of how he has been praying to God to find some direction and that very same day was the day that we knocked on his door. He has started reading the Book of Mormon and has loved the parts that he has read. 🙌🏻 it seriously makes me so happy. I absolutely love the hours of study that we get in the mornings to read and study from the a Book of Mormon. It truly is revelation from God for us living in these latter days. I love the Book of Mormon. I love the comfort that I receive when reading that scripture that changes my day or helps me through the hard times that I am having or answers the question that I had. It's the best. Last Thursday we went to our Ward trunk or treat party and we were so pleasantly surprised when one of the less actives we are working with walked in the door. Sister Flake and I walked into the church and the first thing she said was, "aww man! We should have invited the Putmans!" And then 30 minutes later, cute little Marisol runs up to us to give us a hug. She is adorable. Every time we are in her neighborhood she runs up to us, gives us a high and then asks to watch a video on our iPads. Ha. Don't have too much else to say, but here are some pictures! Saturday morning we had our Willis transfer breakfast! Halloween edition! Halloween was awesome for Sister Flake and I. We had a full proselyting day, which is always the best. We started our day by making some cupcakes for a part member family we are trying to start teaching and for one of our investigators on date. Oh yeah... And we also went to chick fil a today for PDAY. Ha.